Mosquitoes are active at night, so do they sleep during the day? Does a mosquito actually sleep at all, or do they just keep being annoying around the clock? The answer to these questions might surprise you. Their sleep preferences are more similar to other insects than you might imagine. Millions of years of evolution mean the mosquito is biologically developed to be on top of its survival game, even when hibernating. Whether mosquitoes sleep during the day or during the night just doesn’t have a straightforward answer. You might have learned from my previous article about winter hibernation, that the mosquito will go dormant for multiple months a year. Until weather conditions are right, these insects will usually go into a standby mode. But even in the summertime, a mosquito will need to rest at some point. We know they don’t do that in the evening or night, since that’s when they are out to sting us. So will they sleep during daylight time? Here are all the answers. Where Do Mosquitoes Go During The Day? Where mosquitoes go during the day depends on the mosquito, its environment, and what it eats. Crepuscular mosquitoes and night-feeders need shady, moist habitats during the day. Diurnal mosquitoes search for food and mate in the day. But recent studies show that where mosquitoes go in the daytime is never clear-cut. Mosquitoes are notoriously resistant to chemicals and other ways of killing them. Because some mosquitoes are deadly (the other human feeders are simply annoying), a lot of research has been done into mosquito behavior. And the information we humans have gathered is pretty amazing. Especially when you consider the size of the average mosquito brain. Mosquitoes can override their circadian rhythm. That’s a complicated word for sleep pattern. They can change their times of activity and rest. A nocturnal mosquito can quite happily be active during the day. This is definitely the case if its food source is protected by a net, or if winds are strong, rain heavy, or temperatures low. Some mosquitoes even avoid being awake at the times when their predators are most active. This means there is no clear-cut answer to where mosquitoes go during the day. Yes, mosquitoes do sleep; in scientific terms resting or quiescence. Mosquito sleep needs dopamine, making them harder to wake up. It also slows metabolism. In sleeping mosquitoes legs, wing muscles or proboscis may twitch. 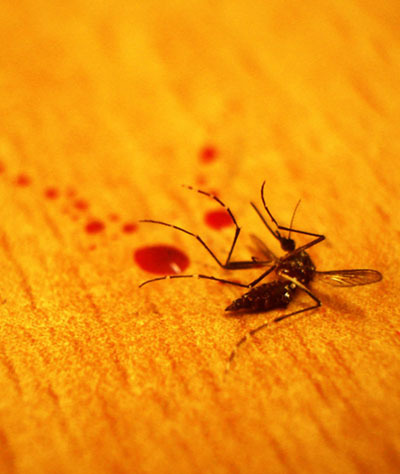 Forcing mosquitoes to stay awake means they must catch up on sleep later on, or die. Where Do Mosquitoes Sleep In The House? Searching for and eradicating mosquitoes one by one is a complete waste of time. First of all, they are tiny. Second, you are trying to destroy something that millions of years of evolution have turned into the ultimate insect. Thirdly, if you do find them, chances are they will sense your rage and find somewhere more peaceful. There is no end to the places a mosquito can rest its weary legs in your home. The good news is, if mosquitoes are sleeping, they are not interested in us. A sleeping mosquito is a harmless mosquito. But if you really don’t like the idea of a mosquito using your home like a hotel, you can limit them by using medium to high fan settings (low won’t make the slightest difference) and the right light traps. You can also find essential oils and plants that might help repel them. You probably won’t get rid of every mosquito in the house at once, though. When Do Mosquitoes Come Out During The Day? Diurnal mosquitoes (active during the day) come out when UV levels (of the rising sun) are at their peak. Nocturnal and crepuscular mosquitoes (active during the night) come out when UV levels match the setting sun. Sorry to say, with mosquitoes the time they appear during the day or during the night isn’t so simple to predict. Imagine a nocturnal mosquito wakes up with the setting sun in the middle of a heavy, all-night storm. It will wait until the storm is over to feed or mate, whatever the time of day. Or imagine a diurnal mosquito waking up when the sun has risen and the day is baking and dry, with hard blowing desert winds. She might wait until the cooler, less windy night. Then she will look for nectar before moving on the nearest human or other mammal. If the human is behind a net, she’ll just wait in a moist, safe place until that human gets out of bed. Simple, really. Mosquitoes are therefore unpredictable. Especially in abnormal weather conditions (which we happen to be experiencing a lot of lately). This means that there’s no ‘best time’ to catch mosquitoes. The best way to prevent being bitten is to use anti-mosquito devices around your routine, not according to the time of day. A large fan on the patio won’t only cool you down on a summer evening, it will blow the zig-zagging skeeters out of range. The right light-traps should be positioned correctly. You will find many ways to avoid mosquitoes in nearly every one of the many informative articles on my site. Do Mosquitoes Stay Out All Night? Mosquitoes can stay out all night as a swarm, but individually don’t stay active all night. Nocturnal female mosquitoes are active when looking for nectar-based and blood meals. They then need 3 to 5 day’s rest. Male mosquitoes only feed on nectar, with alternating periods of activity and rest throughout the night. Crepuscular (the times around sunset and sunrise). This is a seemingly easy way to categorize mosquitoes. It has saved many people from either bites or serious diseases in the past. Usually due to pesticide-treated mosquito nets and other toxic chemicals. We now know this is ineffective. Mosquitoes develop resistance to chemicals very quickly. Humans don’t. Mosquitoes can be found all over the world and in many different environments. They are tiny creatures and weather conditions affect them in ways we don’t expect. Most insects are at their peak populations in damp, warm weather. There’s no mystery to this. In warm, wet weather, plants grow and offer ready food sources to either mosquitoes or their prey. Flying insects have strong ‘skeletons’ but low mass which makes flying in light rain safe. Heavy rain and strong winds can kill mosquitoes. As in many areas of the world, night increases the chance of cold and windy weather. This might be yet another reason why mosquitoes regularly change their sleep/wake cycles. Female mosquitoes, unlike males, can store fat. This gives them an advantage over the males. They can remain active for longer, if necessary. In ideal circumstances, the female mosquito uses her fat reserves to produce eggs. This is why she needs such a long time to rest after a meal. In areas with little food, she can search for longer. Her chances of survival are therefore higher. Even in mosquito species that don’t feed on blood, this is still the case. A female mosquito produces fat from sugar. She needs about one calorie of sugar a day to do this. 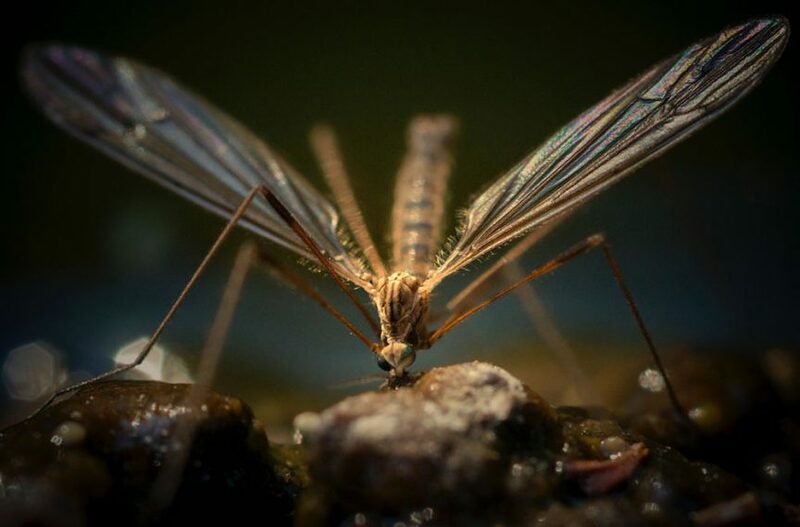 When starved, a female mosquito can live for up to a month (in otherwise ideal conditions). Males can’t turn sugar into fat. They need to preserve their short-acting energy. They take frequent, shorter rests between frequent, shorter flights. So an all-nighter is simply not an option for them. So there you have it. The tiny brain of the irritating mosquito can do amazing things to keep it alive. Mosquitoes don’t mind working shifts, which we humans have a lot of problems with. It doesn’t matter when they sleep, as long as they are awake at the same time food is available. Mosquito existence is pretty basic: wake, eat, mate, sleep – not necessarily in that order. But they do these activities when it’s best for them, and not when it’s best for us. This means we have to be very clever if we want to avoid being bitten. You will find a lot of very clever and tried and tested products on my dedicated products page. Thanks to a lot of research, I can truly recommend them. After all, it’s only when you truly know your enemy that you can defeat him.